Around six in the morning the one downside of our otherwise lovely hotel became apparent. This is an old building and a working one, with several businesses sharing the pretty courtyard, so from quite an early hour we heard the regular crack and bang of heavy doors opening and shutting. But never mind, we had at least slept well till then in the comfortable bed. Breakfast is charged extra at the Fregehaus but was highly recommended in several reviews, so we had decided to treat ourselves. And it lived up to expectations - a great selection of breads, meats, cheeses and various spreads, plus good coffee, fruit juice, muesli and yoghurts, boiled eggs and extras such as olives and tomatoes. 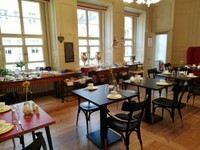 All served in an attractive room next to reception. The weather was still dull, though an improvement was promised for the afternoon, so we decided on an indoor activity for this first morning. Our first thought had been the Museum der Bildenden Künste (fine art museum) but this is closed on a Monday so instead we opted for the 'Runde Ecke' Memorial Museum, housed in the former headquarters of the Stasi in Leipzig. On the short walk there we realised for the first time something that was to strike us again repeatedly during our stay in Leipzig - the high level of ornamentation on most of the older buildings in general, and the number of carved figures and faces in particular. Wherever you go here you are overlooked by these faces in stone. They became something of a theme underlying our explorations, and will be a constant thread running through my blog entries too. Here the Stasi, as the Ministerium für Staatssicherheit (Ministry for State Security) were commonly known, had their Leipzig Headquarters, and the building therefore was a focus for the peaceful protests that precipitated the fall of the GDR, known as the Monday Demonstrations. The Monday Demonstrations were peaceful political protests against the government of the German Democratic Republic (GDR) that started here in Leipzig in September 1989. They took place every Monday evening after the weekly Friedensgebet (prayer for peace) in the Nicholaikirche, at first just in the Nicholaikirchhof, and then as they grew in size, spreading to the nearby Karl Marx Platz (today restored to its original name of Augustusplatz). At that time Leipzig was slightly more open to influences from the west than were other GDR cities, because of its major trade fair, the Leipziger Messe, which allowed businessmen and media from West Germany to enter East Germany. One focus for the protests was the people’s demand to be allowed to travel outside the Soviet block. By 9 October 1989 the gatherings at the Nicholaikirche which had begun with just a few hundred people had swollen to more than 70,000 (out of Leipzig’s total population of 500,000). The protestors marched right past the Runde Ecke. Although the state had mobilised thousands of soldiers and police forces to intervene, no order to do so was given, and the city authorities, with no instructions from East Berlin and taken aback by the size of the crowd, instead ordered their troops to withdraw. On 16 October 1989, 120,000 demonstrators turned up, with military units again being kept on stand-by but not intervening. A week later the numbers more than doubled to 320,000. This pressure, added to the growing numbers of Monday Demonstrations in other cities, contributed significantly to the fall of the Berlin Wall on 9 November 1989, and eventually to the end of the GDR regime. The protests continued throughout November and December, piling pressure on to the crumbling regime and its institutions. 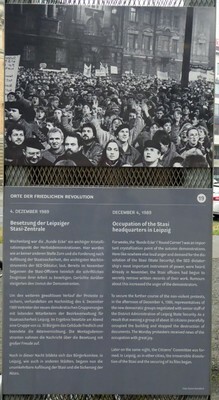 On 4 December 1989 the protesters entered the Runde Ecke and occupied it, primarily in order to stop the destruction of files. Realising that their time was up and panicking about all the evidence kept in their files, the Stasi had begun to systematically feed the files into shredders. They used special ‘wet shredders’ which turned the shredded paper into a pulp, rendering it completely unreadable. This occupation of the Runde Ecke brought a halt to that process here in Leipzig. That night the Bürgerkomitee Leipzig (the 'citizens committee of Leipzig'), was founded, with a mission to safeguard the evidence. This museum is the result of their efforts and is still run by the committee. This gives it a slightly amateurish and decidedly old-fashioned air, but that in a way adds to its appeal, as it feels very genuine and heartfelt in its mission to preserve what remained of Stasi activity and to expose it. 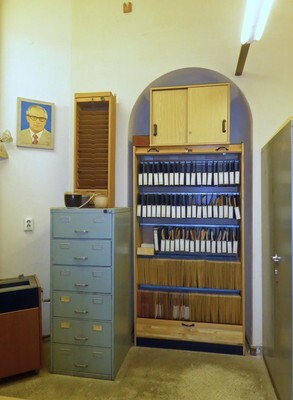 The permanent exhibition, entitled Stasi – Macht und Banalität (Stasi – Power and Banality), is set out in a series of rooms which otherwise remain much as the Stasi left them, with the original lino and curtains. 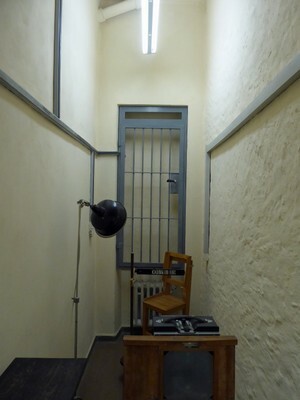 As you walk through these corridors and former offices, you can experience the building as it was in the days when Stasi officers recruited their informers, wrote and filed their reports on citizens, opened letters arriving from outside the country, planted cameras and other monitoring devices in buildings, and interrogated their prisoners. Entry to the museum is free, although even if a charge were made it would be well worth visiting. Displays cover various aspects of Stasi activity and their impact on daily life in the GDR. The extensive captions are all in German, but an audio guide (available in several languages) can be hired for 5€. We didn’t bother however, as Chris’s German is sufficient to translate most of the explanations and he was happy to do so. One of the first rooms you see is a Stasi employee’s office, left almost untouched since the day it was abandoned. Opening of letters (both those written by citizens and those received from the West) - the letters were carefully steamed open using a range of devices, and resealed with special glue which mimicked that used on envelopes. There were separate devices for self-sealing envelopes. The pressure put on ordinary people to spy on their neighbours as ‘Mitarbeiter’ (collaborators) - everyone was encouraged to play their part in maintaining the system . Spy equipment such as tiny cameras (including one that was hidden in a false stomach, and another in a briefcase), listening and recording equipment (one disguised as a lady’s handbag), false noses and wigs, etc. 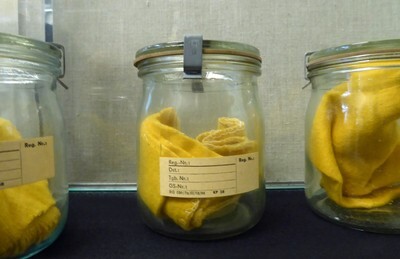 Stasi members were trained to disguise themselves, for instance as a builder or an Arab, and were even trained to make their own false beards and hair extensions. On the way out we took a better look at the exterior of the Runde Ecke building, which was originally constructed for an insurance company in the early 20th century, in what is known as the Gründerzeit style. For a brief period immediately after the Second World War it was used by the US occupying forces, serving as the regional seat for their military administration. A small memorial plaque to the right of the main entrance commemorates the liberation of Leipzig by US troops in April 1945. When Leipzig was handed over to the Soviets in July 1945 they also took over the administration building. In 1950 the newly-founded GDR security police, the Stasi, moved in, and were to stay for forty years. We made a brief detour to check out the nearby statue of Richard Wagner, which caught our eye because it is unusually brightly coloured. This was erected here in 2013 to mark the composer’s 200th birthday. Made in bronze, it stands on a plinth dating back to the 1920s. This was the work of the famous Leipzig artist, Max Klinger, who had been commissioned in 1903 to design a monument to Wagner to stand here in the city where he was born. The outbreak of World War One interrupted his work, and although the half-made plinth was later finished by Leipzig sculptor Johannes Hartmann, the statue designed by Klinger never materialised. The plinth, which depicts figures from Wagner’s work, stood for eighty years in a Leipzig park, the Palmengarten, before being moved here to the spot where it was originally intended to stand. The new statue, the work of Stephan Balkenhol, shows a young Richard Wagner standing in front of a black bronze plate in a shape that echoes Klinger’s original design for the statue. The figure above is Mime, from the story of Siegfried, in the third part of the Ring of the Nibelung Cycle, and is on the left hand side of the plinth as you face Wagner. On the front of the plinth the three Rhine water nymphs or Rheintöchter from the same cycle. There was some controversy at the time of its first unveiling because they are depicted unclothed. We had drinks in a pavement café, Zum Arabischen Coffe Baum, near the Lipsia Fountain on the Kleine Fleischergasse. 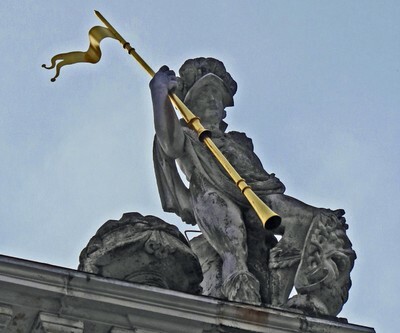 Built in 1913 to a design by Max Lange (as part of a competition for the beautification of the city) the fountain was originally known as the Puttenbrunnen, named for the cherubs below the upper bowl of water, known in Italian as putti. But the popular name of Lipsia, taken from a nearby building of the same name, has stuck. Drinks finished, and with brightening skies and temperatures rising, we stopped off at the hotel to drop off our coats. This led to another detour, into the fascinating shop on the opposite side of the courtyard which sells antiques, collectibles and downright oddities - beautiful old lamps and coloured glass sit side by side with animal skeletons. Drawings of skulls, a lamp shaped like the Eiffel Tower (more than a metre high), another (smaller) like a crocodile with the bulb between its teeth, old toy cars and a dolls house, many many hats, a pair of worn ballet shoes … truly a treasure trove, of sorts! A sign at the door said no photos, but I sneaked a couple! ‘Built in 1678/87 on the initiative of 30 tradesmen probably following drafts of the Saxon state master builder Johann Georg Starcke. Anyway, this statue was erected in 1903, the work of Carl Seffner. Originally a marble statue was planned but this final result is in bronze. I read on the German Wikipedia page that a 28-year-old Leipzig gym teacher in theatrical costume served as a model for the young Goethe, but that as there were no images of the poet from his time here, his face is taken from later portraits. From here we walked through the fascinatingly decorated Handelshof shopping arcade to emerge by the Nicholaikirche, the largest church in the city. Before going inside we stopped to photograph the large building that faces it across the Nicholaikirchhof. This is, I believe, the Priests’ House, built in 1886/87 according to a design by Hugo Licht – the architect also responsible for the Runde Ecke some 25 years later (and for the Neues Rathaus, which we were to visit and admire later in our stay in Leipzig). Before exploring the church itself, it’s worth reflecting on the part it played in the Monday Demonstrations, the peaceful political protests against the government of the German Democratic Republic which I described above. While the church didn’t organise these protests, it did trigger them (through the regular prayers for peace) and provide support and a focus for communication between protestors. The column in the Nicholaikirchhof, erected in 1999 and a replica of the columns inside the church, is a memorial to the demonstrations. Its design symbolises how the ideas of freedom which started inside the church were carried out into this public space and beyond. A sign at the door of the church said that photography was only permitted on payment of 2€ in the bookshop. I went to pay and was given a sticker to wear, but I soon realised that several other people were happily taking photos on their phones without paying. The same sign also said that photos shouldn’t be posted on the internet, but as I share them here to promote the church and not for my own commercial gain, and as there are already many photos posted by others, I choose to ignore that request, feeling I have done my bit by paying the fee that most other visitors avoided! The interior was remodelled by the German architect Johann Carl Friedrich Dauthe in the Neoclassical style in the late 18th century, and the result is one of the most striking church interiors I have seen, in colours reminiscent of ice cream perhaps, or delicately flavoured cakes! Even before the Monday Demonstrations this was a pioneering church. It was here in 1539 that the Reformation in Leipzig began with the first Protestant church service. Today the church is Lutheran. Johann Sebastian Bach was musical director here and at the Thomaskirche from 1723–50, and several of his works premiered here, including the St John Passion. OK, this is proving rather a long entry and no doubt is testing your stamina, as it is mine! I’ll take a break here and continue this day in my next entry. Like you I also love faces in the stones. Great pictures. Fascinating. I think my son-in-law would like the part about the Stasi (I don't know how to get it to him as he does not even do email). I don't mind paying money up front to take photos. I'd rather do that than be told I was not allowed. And the people that don't pay - that's on their conscience, assuming that they have one. Another super blog with more super pictures. I recognise quite a few of these places but I didn't get around to seeing the Runde Ecke which would have appealed to my morbid fascination for these sort of organizations. Thank you all.The Runde Ecke was definitely a highlight of the trip, we both found it fascinating. Rosalie, how can anyone not do email in this day and age?! I guess you could always write the url in an old-fashioned letter and send it to him, but is he not online at all? If so, a url is of no use. You'll have to print off the page and mail it to him!! We missed the Runde Ecke, but did manage to take in the DDR Museum instead! My son-in-law may do email but I don't know his email address and he doesn't do FB. All of our communication (other than in person) is through our daughter who is a computer guru type person. So I'll send it to her. Great Rosalie - hope he enjoys it! Thanks for stopping by Keith. The DDR Museum was closed for major renovation so we had to give that one a miss - a shame as it sounds interesting. This was an interesting day in Leipzig! The Stasi stuff makes me very nervous, especially since some dumb muppets seem to have this time back..... Excellent detail photos and also description of the peaceful demonstrations. Haha, you made my day start with a laugh with your remark about Goethe :-) Thanks :-) And I see that you visited Handelshof. Yes, this was the courtyard I meant earlier. Too bad the DDR Museum was closed. I found it really interesting because I used to have relatives in the DDR and visited several times in various decades.